Oranges 11? Does that work as a pun? It's exactly what it looks like, folks. Sometimes, though, those car chases involve an old Honda Civic full to the brim of oranges. In Seville, Spain, Europa Press reports that local police grew suspicious at the sight of a line of three cars driving very close together. When the vehicles made a “sharp maneuver,” as the English translation describes it, the cops grew more curious and tried to pull tried to pull them over, which erupted into a short chase before two of the cars eventually stopped. The vehicles were carrying five people: a couple, their adult son, and two brothers (it’s unclear if the brothers are related to the other three). But what’s more interesting is that when the passengers opened the car doors, piles of oranges came tumbling out. Insane amounts. Like when you frantically clean by shoving everything into a closet and have to open it later. They spilled everywhere. It appears it was about four tons of oranges in total, which has a wholesale value of about $2,800. The drivers insisted that they had simply been purchasing oranges during a road trip, which the police did not believe at all. 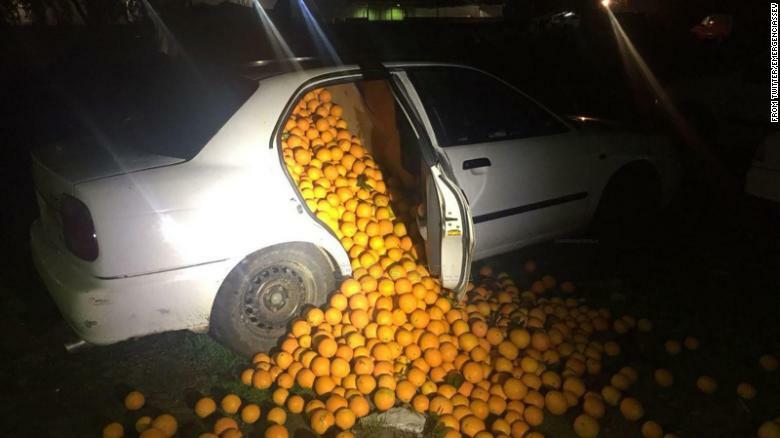 Turns out that a shipment of oranges in Carmona, Spain had reported a theft shortly before the orange-heisters were stopped, two events which could well prove to be connected in some way. Spain is Europe’s top orange producer, and is having a strong year, with total citrus production up about 20 percent over 2016. No word on precisely what type of orange was involved in this case; in the images, they appear a bit too smooth to be classic Seville oranges, which are typically used for marmalade. We will keep you updated if we learn more.